Signal, the popular end-to-end encrypted messaging app, is planning to roll out a new feature that aims to hide the sender’s identity from potential attackers trying to intercept the communication. Although messages send via secure messaging services, like Signal, WhatsApp, and Telegram, are fully end-to-end encrypted as they transmit across their servers, each message leaves behind some of the metadata information that reveals who sent the message to whom and when. The new feature, dubbed “Sealed Sender,” announced by Signal is going to further reduce the amount of information that is accessible to the company itself. However, you should note that Signal never stores metadata or logs of information on its users like who sends messages to each other and when, but the new feature would protect the sender’s identity in case the communication is somehow intercepted. How Does the Signal’s Sealed Sender Feature Protect Metadata? According to a blog post published by Signal on Monday, the Sealed Sender feature uses an encrypted “envelope” containing the sender’s identity and the message ciphertext, which is then decrypted at the end of the recipient with their own identity keys. The app encrypts the message using Signal Protocol, as usual. Include the sender certificate and encrypted message in an envelope. Encrypt the envelope using the sender and recipient identity keys. Without authenticating, send the encrypted envelope to the Signal server along with the recipient’s delivery token. The message recipient can then decrypt the envelope by validating the identity key to know the sender of the message. It should be noted that since the new technique eliminates the company’s ability to validate sender’s certificate that was being used to prevent abuse and spoofing, the service has introduced additional workarounds that still allow users to verify who sent the incoming messages. 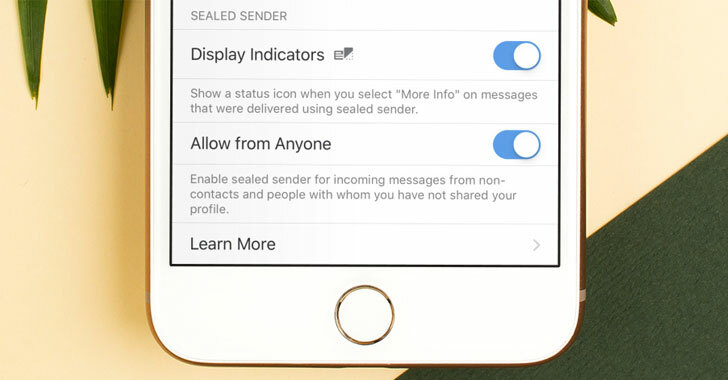 Sealed Sender is currently in the beta version of the Signal app, so beta users can enable the feature via Settings → Sealed Sender, and enable “Allow from Anyone” toggle, to receive ‘sealed sender’ messages from non-contacts and people with whom they haven’t shared their profile or delivery token. Besides protecting the Sender’s identity, the company is also finding ways to encrypt IP addresses and other sensitive metadata information that could be revealed by analyzing users’ network traffic. 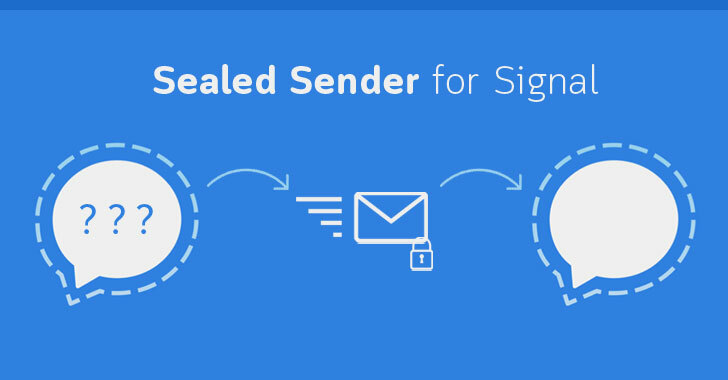 The Sealed Sender feature will be enabled by default in the upcoming version of Signal.